On August 2nd I launched my first program, Find Your Tribe Online. The idea for Find Your Tribe Online came from my desire to help bloggers. My mission is to explore and create solutions to problems in order to make people’s lives easier, happier, and more rewarding. In short, I like to help people. 🙂 I know the one thing bloggers want for their blog is traffic. 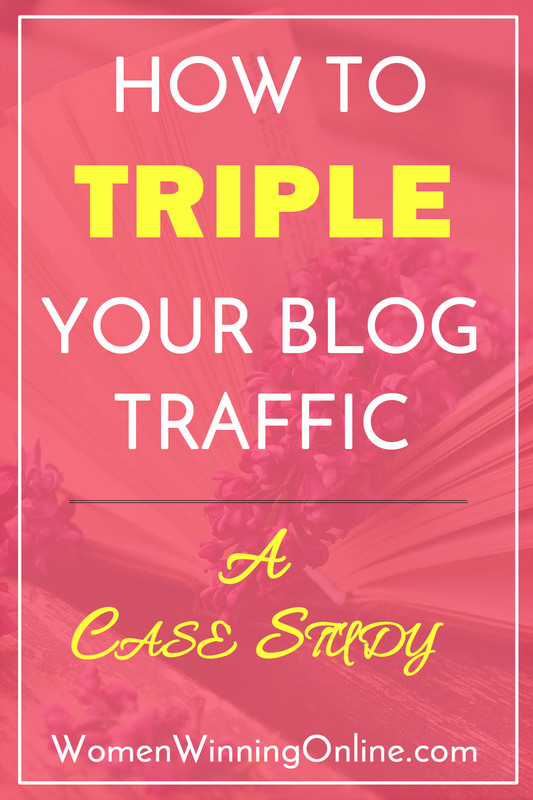 I wanted to figure out how to help bloggers get more traffic faster and easier. 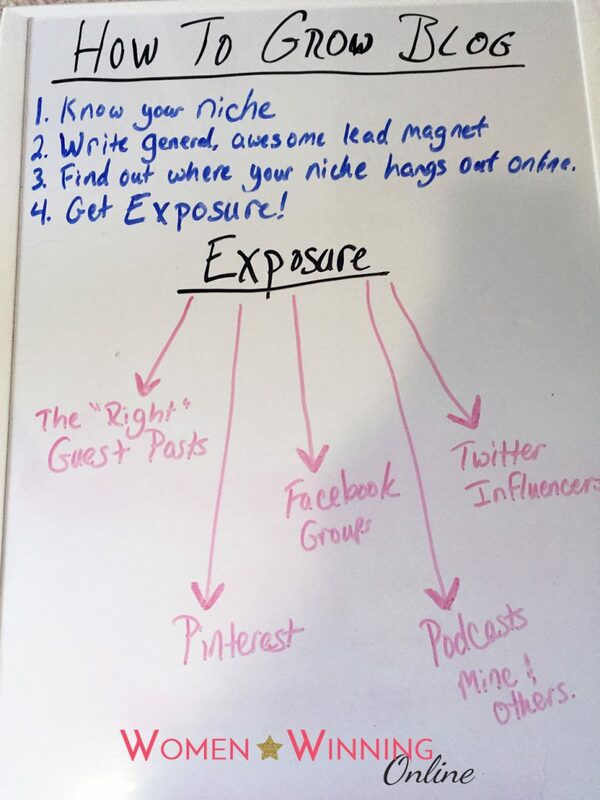 In the middle of June I sat down with my whiteboard and started diagramming how bloggers get traffic. A lot of bloggers will tell you how to get traffic, but they won’t go deep and tell you the exact steps to get there. So I studied them. I studied the big bloggers and how they grew their traffic. How did they get to be big bloggers? First and foremost they were writing great content. All the marketing in the world can’t save your blog if you aren’t writing great content. After that what was it? What made them big bloggers?! They were doing everything they could to get exposure to their blogs. With that one word in mind plus my research, this is what my whiteboard diagram looked like when I was finished. Now that I felt like I figured out this magic word and all the ingredients that go into getting exposure, it was time to figure out how to make it happen. Enter Find Your Tribe Online. I quickly realized the fastest way for bloggers, myself included, to get exposure is to go find out where your people are hanging out online. Then engage with them, help them, and drive them back to your blog. The best way to do that right now is to guest post and comment on popular blogs in your niche. It is also to join Facebook groups and Pinterest group boards where your niche is hanging out. This is how you get exposure for your blog. This is how you get more traffic for your blog. After 60+ hours of research in June and July, I officially launched Find Your Tribe Online. The first edition included 140 Pinterest group boards, 160 Facebook groups, and 155 popular boards across 14 niches. At the time this post was published, 226 copies of Find Your Tribe Online have been sold in two and a half months. I am truly in shock over this and so very grateful for the support! But I also know that people didn’t buy it just because they like me. They bought it because of the stories that came from other women that purchased it and implemented the strategies in Find Your Tribe Online. As my way of saying thank you, I want to share some of these stories with you. I want to show you how real life women bloggers are having success with Find Your Tribe Online. Last week I put out a call for feedback on FYTO. Within 24 hours I had 20 people respond. Here’s a look at what they had to say! What made you decide to buy Find Your Tribe Online? I don’t have a lot of time, with homeschooling kids and having toddlers, to do research in order to even START to find my tribe. For months I’ve been trying to figure out who my audience is and it was driving me nuts. And when I stumbled upon your site (sorry can’t remember how I got there) and I clicked on that button and got on your landing page. What made me buy FYTO is that little phrase you have: But where are your people? I was hooked. I had just signed up for Tailwind and realized I needed more group boards in my niche to schedule pins to. I knew I would be needing it to help grow my list! I saw a girl recommending FYTO on a Facebook thread and she was so happy about it, that I thought why not try it out. After blogging off and on for four years, I wanted my newest blog to thrive. I needed to take proper measures to find my audience. I wanted to many connections and learn from others in my niche and I was having a hard time finding these people! I loved the idea of having all of that information in ONE place (instead of spending hours trying to find it while I could be working on making my blog greater!). I needed a way to start getting my name out there, and one of the most effective ways to get started marketing yourself, is to engage with those in your niche: join Facebook groups, participate in promo threads, join Pinterest Group Boards — FYTO was a culmination of all those things I needed without having to spend hours doing research on who to contact in order to join, and what boards or groups existed that would benefit me. How did you use Find Your Tribe Online to grow your blog? I have joined group boards in my niche and am following bloggers in my niche. I joined a few more Facebook groups and I asked to join a few more Pinterest collaborative boards. All have helped me grow my network and my blog. I’ve joined all the Pinterest and Facebook groups related to my niche and I’ve already been pretty active. My blog has been getting more traffic than before, which is super exciting. I know if I keep going it’ll be better in future as well. I first did the Pinterest strategy, and with that I saw my traffic triple overnight. I then worked on pitching for guest posts. I’ve already landed one big one and that is driving some traffic to my site as well. I started with finding Facebook groups within my niche. I’m in three different niche categories, so I took one Facebook group from each category and worked with those groups for a week. Then, the following week, I added three more Facebook groups and worked with those. For Pinterest, I contacted two or three group board owners (within my niche) a week. Upon being added, I would repin three to five pins from that board, then add two to three of my own pins, each day. The most influential part for me was the Pinterest Group Boards. I am in so many now, some with 10’s of thousands of followers! I probably would have never heard of them before FYTO! I initially joined Facebook groups and started sharing my content with other bloggers. I shared theirs, they shared mine, and this helped my blog reach an audience I wasn’t reaching. What are some of the results you have seen from implementing FYTO? A drastic increase in blog traffic! Especially from sites that I wasn’t getting much traffic from – like Pinterest! Traffic has tripled. I receive views even when I don’t have time to self-promote. I get new followers every day thanks to FYTO. Being in a group with other bloggers has brought my blog to the next level. They’re helpful and kind and I love having my Tribe in my corner! I am getting 3-5 new followers on Pinterest every day! My page views have definitely increased since expanding my marketing reach using social media groups & group boards, and I’ve also been able to provide guest posts (and feature guest posts) by the connections I’ve made in some of the Facebook groups! What is one tip you would give everyone who purchases Find Your Tribe Online? Take one thing at a time! I tried to do a little bit of everything in one go and got nowhere! Go through it step by step and take it slow. There is a lot of good stuff! Don’t feel like you have to rush it. I still haven’t had time to implement the other FYTO options because life has been busy. Branch out a little in terms of what groups/group boards you would initially think of joining – go outside your niche a tiny bit if you can, because many of the groups will still work for you, even if in a smaller way – every little bit counts! Buy and be prepared for the gift that keeps on giving, if you are ready to be a giver, too! First I have to say I am so grateful to these ladies for taking the time to answer my questions about Find Your Tribe Online! We are all busy women so I appreciate their time so very much! Find Your Tribe Online was created for you dear blogger. I wanted to create something that would actually help you. Not just another tool that was filled with empty promises. More importantly I wanted it to be action based. I wanted to give you the data plus a marketing plan to take action. 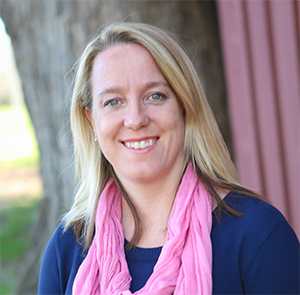 Like the women in this case study said, don’t try to do it all at once, but do try it! There are actionable steps in Find Your Tribe Online that you can do and grow your blog literally overnight. How exciting is that?! Have you purchased Find Your Tribe Online? I would love to hear your experiences with it! What else are you doing to get traffic to your blog? Please share your thoughts with us in the comments below!